Albuquerque: University of New Mexico Press, 1988. 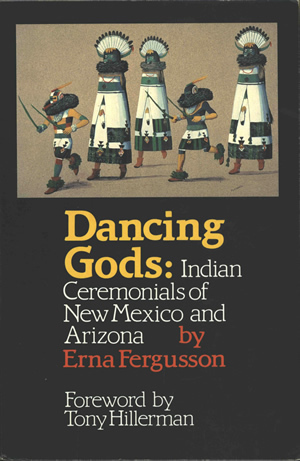 This is the fourth paperback printing of Dancing Gods: Indian Ceremonials of New Mexico and Arizona by Erna Fergusson, with a Foreword by Tony Hillerman. This edition was published in 1988 by the University of New Mexico Press in Albuquerque. The cover illustration is "Zuni Shalako Dance" by Fred Kabotie. The book title and author's name are printed below the drawing in yellow, white and red on a black background. The back cover contains a description of the book's contents, praise quotes, publisher information, and cover credits printed in black on white. The inside front and inside back covers are blank. Binding: Full-color paper covers. The spine has a black background, with the book title, author, and colophon printed horizontally.